George McNeil was one of the most important and influential New York School artists and teachers of his generation. There is no period during his six-decade long career in which his work is not highly regarded. McNeil’s work has been prominently and widely exhibited ever since his debut as one of only five non-objective painters in the New York World’s Fair Show of 1939. Today, his work can be found in such important collections as: the Metropolitan Museum of Art, the Museum of Modern Art, the Whitney Museum of American Art, the Brooklyn Museum of Art, the Walker Art Center in Minneapolis, and the Museum of Contemporary Art in Los Angeles, to name a few. Looking back on his lengthy career, McNeil must be considered one of the preeminent American expressionist painters of the 20th Century. His work evolved successfully from the post cubist abstract expressionism of his Hofmann School days, through the figurative expressionism of his mid-career during the 1960’s and 1970’s, to emerge as full-blown neo-expressionism in the 1980’s and 1990’s. With “avant-gardism” as his watchword McNeil was always at the forefront of the American expressionist movement. His extraordinary body of work pays tribute to his enormous talent and his uncompromising commitment to artistic growth. 1910 Born February 22, New York City to Irish-American working-class family. 1922-1926 Attends art classes at Brooklyn Museum while studying at Brooklyn Tech High School. Influenced by the museum’s Societe Anonyme collection containing works by Picasso, Matisse, Duchamp and Picabia. 1927 Wins New York Art League Scholarship and enters General Art Program, Pratt Institute, Brooklyn, NY. 1927–1932 Studies work by French Modernist artists and copies works in Metropolitan Museum of Art. Attends and is influenced by Vaclav Vytlacil’s lectures at the Art Students’ League, where he studies with Jan Matulka. Becomes acquainted with Arshile Gorky. 1932–1936 Studies with Hans Hofmann, first at Art Students’ League, then at Hofmann’s own school. Begins to develop his own theories of modern art. Friends with Mercedes (Carles) Matter, Lee Krasner, Rae (Kaiser) Eames, Giorgio Cavallon and John Opper. 1935 Joins the W.P.A. and serves on the Federal Art project with artists such as Willem de Kooning and James Brooks. Supported by Burgoyne Diller on Williamsburg Mural Project. 1936 Founder member of American Abstract Artists with Ibram Lassaw, Ilya Bolotowsky, Rosalind Bengelsdorf and others. Combatting the rejection of contemporary American abstract art by museums, galleries and critics, the AAA publishes brochures and organizes annual exhibitions of works by members. Marries fellow Hofmann student Dora Tamler. 1936–1937 Serves as monitor in Hofmann’s classes and teaches class in collage. 1939 Exhibits in American Art Today at the New York World’s Fair, where he is one of only five non-objective artists represented. Named by Stuart Davis as alternate for World’s Fair Committee of Selection. Visits Mexico and studies murals. 1940 Visits Cuba for four months. Work reflects Cuban dance and cafe life. 1941 Has one-person exhibition in the Lyceum Gallery, Havana, Cuba. 1943–1946 Serves in the U.S. Navy. 1946–1948 Teaches at the University of Wyoming at Laramie. 1947 Exhibits in Abstract and Surrealist Art at Art Institute of Chicago, first large-scale exhibition of contemporary American modem art. 1948–1960 Serves as Director of Evening Art Program at Pratt Institute, Brooklyn, where he brings in Philip Guston, Franz Kline, Reuben Nakian and others to teach classes. Friendship with Kline. 1950 One person exhibition at the Charles Egan Gallery, New York, a gallery featuring emerging Abstract Expressionist artists such as Philip Guston, Franz Kline and Robert de Niro Sr.
1951 Participates in a group exhibition Abstract Art in America at Museum of Modern Art, New York. 1952 One-person exhibition at the Charles Egan Gallery, New York. 1953 One-person exhibitions at the Charles Egan Gallery, New York and Brown Gallery, Boston. Participates in the Carnegie International group exhibition in Pittsburgh and in the Whitney Museum Exhibition (later known as the Whitney Biennial) in New York. 1954 Has one person exhibition at the Charles Egan Gallery, New York. [mid 1950s] McNeil’s painting style changes: work remains abstract but uses larger canvases, looser forms and a complex palette. Work exhibited at HCE Gallery Provincetown, MA, where McNeil spends summers 1948–63. 1956 Has one person exhibition at the De Young Museum, San Francisco; teaches at University of California at Berkeley 1956–67. 1957 Has one person exhibition at the Poindexter Gallery, New York. Represented again in Whitney Museum Exhibition. 1958 Joins life-drawing group with Mercedes Matter, Charles Cajori, Sidney Geist and others (through 1970s); group forms genesis of the New York Studio School. 1959 Has one person exhibition at the Poindexter Gallery, New York. Program and painting in MA program. 1960 Has one person exhibition at Howard Wise Gallery. 1961 Has one person exhibition at Nova Gallery, Boston; participates in Abstract Expressionists and Imagists, group exhibition at the Pennsylvania Academy of Fine Arts, Philadelphia; again participates in group exhibition at Whitney Museum. 1962 Has one person exhibition at Howard Wise Gallery, New York. Participates in group exhibition at Pennsylvania Academy of Fine Arts, Philadelphia. 1963 Receives Ford Foundation Purchase Award. Participates in Directions: Painting USA, group exhibition at the San Francisco Museum, San Francisco. 1964 One-person exhibition at Howard Wise Gallery, New York. Begins to spend part of every summer teaching and painting in France (to 1970). 1965 Again participates in Whitney Museum Exhibition. 1966 Has survey exhibition at University of Texas at Austin; has one person exhibition at Great Jones Gallery, New York; participates in Pennsylvania Academy of Fine Arts exhibition. Receives National Council on the Arts Award. 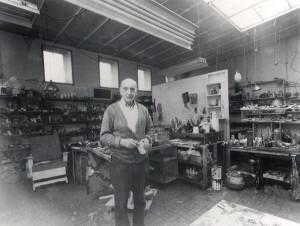 Begins teaching at New York Studio School (to 1980). 1968 Has one person exhibition at Howard Wise Gallery: first exhibition of McNeil’s paintings of nudes in the Dancer and Bather series. The First Generation at the Museum of Modern Art, New York. Awarded Guggenheim grant. 1973 Has one person exhibition at Pratt Manhattan Center, New York. 1975 Has one person exhibition at the Landmark Gallery, New York. 1976 Participates in Advocates of Abstraction: The American Abstract Artists 1936-1943 at downtown Whitney Museum, New York. New Mexico Art Museum, Albuquerque, New Mexico. Figurative works now often represent identifiable dramatic situations. 1979 Has one person exhibition at the Dintenfass Gallery, New York. 1981 Has one person exhibition at the Gruenebaum Gallery, New York; begins Disco paintings. has one person survey exhibition George McNeil: the Past Twenty years at the Museum of Art, Fort Lauderdale, Florida. 1983 Has one person exhibition at the Gruenebaum Gallery, New York. Participates in The Painterly Figure, group exhibition at the Parrish Art Museum, South Hampton, New York. 1984 Has survey exhibition covering work 1954–84 at Artist’s Choice Museum, New York. 1985 Has one person exhibitions at SUNY at Binghamton New York; Kasmin Knoedler Gallery, London, UK; and Gruenebaum Gallery, New York. Receives honorary Doctor of Fine Arts from Pratt Institute. 1986 Has one person exhibition at the University of Bridgeport, Connecticut. Participates in American Masters: Works on Paper, group exhibition at the Corcoran Gallery, Washington, DC. 1987 Has one person exhibition at the Gruenebaum Gallery. Participates in group exhibitions Working in Brooklyn, Brooklyn Museum of Art; The Interior Self, Montclair Art Museum, Montclair, New Jersey; Elders of the Tribe, Bernice Steinbaum Gallery, New York. 1988 Receives honorary Doctor of Fine Arts, Maryland Institute College of Art. Begins graffiti and topographical paintings celebrating New York and its street life. 1989 Has one person exhibition at Knoedler Gallery, New York. Residency at University of Hartford; has one person exhibition at the Joceloff Gallery, University of Hartford. Elected to membership of the American Institute of Arts and Letters. 1990 Teaches Invitational Master Class at the Fine Arts Work Center, Provincetown, MA. Has survey of lithographs George McNeil: Three Decades of Prints at Montclair Art Museum, Montclair, New Jersey. Wife Dora McNeil dies. 1991 Has one person exhibition at Hirschl and Adler Modem Gallery, New York. 1990s Paintings become overtly psychological and fetishistic. Last lithographs 1991. Paints and revises work through 1994. 1992 Has one person exhibition, Manny Silverman Gallery, Los Angeles. 1993 Has one person exhibition at the New York Studio School, New York; has one person exhibition at Rena Bransten Gallery, San Francisco. 1994 Has one person exhibition at ACA Galleries, New York. 1971 Tamarind Institute, Artist-in-Residence. Also 1975, 1976, 1984. 1982 American Academy of Arts and Letters. Elected member 1989. 1941 Lyceum Gallery, Havana, Cuba. 1950 Charles Egan Gallery, New York. 1952 Charles Egan Gallery, New York. 1953 Charles Egan Gallery, New York. Brown Gallery, Boston, Massachusetts. 1954 Charles Egan Gallery, New York. 1956 De Young Museum, San Francisco, California. 1957 Poindexter Gallery, New York. 1959 Poindexter Gallery, New York. 1960 Howard Wise Gallery, New York. 1962 Howard Wise Gallery, New York. 1964 Howard Wise Gallery, New York. Great Jones Gallery, New York. 1967 Howard Wise Gallery, New York. 1969 Des Moines Art Center, Des Moines, Iowa. 1973 Pratt-Manhattan Center, New York. 1975 Landmark Gallery, New York. 1977 Berman Gallery, New York. 1979 Dintenfass Gallery, New York. 1981 Gruenebaum Gallery, New York. 1982 George McNeil: Paintings and Prints, Jorgensen Gallery, University of Connecticut at Storrs, March 22–April 16, 1982. George McNeil: The Past Twenty years, Museum of Art, Fort Lauderdale, Florida, December 6–31, 1982. Catalogue essay by Carter Ratcliff. 1983 Gruenebaum Gallery, New York. 1984 George McNeil: Expressionism 1954–1984, September 22–November 10, Artists’ Choice Museum, New York. 1985 Kasmin Knoedler Gallery, London, UK. George McNeil Abstractscapes, Robeson Center Gallery, Rutgers, the State University of New Jersey, New Brunswick, New Jersey. 1986 Carlson Art Gallery, University of Bridgeport, Connecticut. 1987 Gruenebaum Gallery, New York. 1989 Joceloff Gallery, University of Hartford, Connecticut. 1991 Hirschl & Adler Modem, New York. George McNeil: Three Decades of Prints, Montclair Art Museum, Montclair, New Jersey. 1992 Manny Silverman Gallery, Los Angeles, California. 1993 New York Studio School, New York. Catalogue essay by Donald Kuspit. 1994 ACA Galleries, New York. 1996 Nardin Galleries, Somers, New York. 1998 ACA Galleries, New Yark. 1999 George McNeil: the Late Paintings 1980–1995, The Hyde Collection Art Museum, Glens Falls, New York May 23–August 22; North Dakota Museum of Art, Grand Forks, North Dakota, September 20–November 1. Catalogue essays by Eleanor Heartney and Johathan Sandofer. 2002 George McNeil: Bathers, Dancers and Abstracts, ACA Galleries, New York, April 13–May 11, 2002; Provincetown Art Association and Museum, June 14–July 21. Catalogue essays by Peter Selz, Lillian Orlowsky,Paul Resika and Helen McNeil. George McNeil Abstractscapes, ACME Fine Art, Boston, Massachusetts, May 6–June 11, 2002. 2003 Luise Ross Gallery, New York March 6–May 3, 2003. 2005 Salander O’Reilly Galleries, New York. 2006 George McNeil: At Midcentury ACME Fine Art, Boston, Massachusetts, January 12–February 18, 2006. 2008 George McNeil: Paintings from the 1950s & 1960s, ACME Fine Art, Boston, Massachusetts, October 17 – November 15, 2008. 2010 George McNeil: The Women, 1938-1972, ACME Fine Art, Boston, Massachusetts, January 15- March 6, 2010. 1939 American Art Today, New York World’s Fair. 1947 Abstract and Surrealist American Art, The Art Institute of Chicago. November 6, 1947–January 11, 1948. 1950 Post-Abstract Painting 1950: France-America, Provincetown Art Association, Provincetown, Massachusetts, August 6–September 4, 1950. 1951 Abstract Painting and Sculpture in America, Museum of Modern Art, New York. 9th Street Exhibition of Paintings and Sculpture, New York May 21–June 10, 1951. 1953 Whitney Museum Exhibitions, Whitney Museum of American Art, New York. 1954 Third Annual Exhibition of Painting and Sculpture, Stable Gallery, New York, January 26–February 20, 1954. 1955 Fourth Annual Exhibition of Painting and Sculpture, Stable Gallery, New York, April 26–May 21, 1955. Drawings, Watercolors and Small Oils, Poindexter Gallery, December 19, 1955–January 7, 1956. 1956 American Abstract Artists, Riverside Museum, New York, April 8-May 20, 1956. 1957 Whitney Museum Exhibitions, Whitney Museum of American Art, New York. 1958 Carnegie International, Pittsburgh Pennsylvania. 1959 Work of Twenty-Five years by Five Contemporary Painters, Camino Gallery, New York. Painting and Sculpture Acquisitions, Museum of Modern Art, New York. George McNeil and Michael Loew, Rutgers University Art Museum, New Brunswick, New Jersey. 1960 Contemporary American Painting, Columbus Gallery of Fine Arts, Columbus, Ohio, January 14–February 18, 1960. 1961 Whitney Museum Exhibitions, Whitney Museum of American Art, New York. Contemporary Paintings Selected from 1960-61 New York Gallery Exhibitions, Yale University Art Gallery, New Haven, Connecticut. Some Contemporary American Artists, Cleveland Museum of Art, Cleveland, Ohio. American Abstract Artists and Imagists, Solomon R. Guggenheim Museum, New York. 66th Exhibition of Contemporary American Painting, circulated by USIA in Latin America, 1961–62. Joint exhibition with Stephen Pace, Walker Art Gallery, Minneapolis, Minnesota. 1962 Continuity and Change, Wadsworth Athenaeum, Hartford, Connecticut. 66th American Exhibition, Paris, France, circulated by the Art Institute of Chicago. Pennsylvania Academy of Fine Arts Exhibition, Philadelphia, Pennsylvania. 1963 Directions: Paintings USA, San Francisco Museum, California. Art in Embassies, circulated by Museum of Modern Art, New York City. 1964 Recent American Paintings, University of Texas Art Museum, Austin, Texas. 1965 Annual Exhibition, Whitney Museum of American Art, New York City. Art on Paper, Weatherspoon Gallery, University of North Carolina at Greensboro, Nov 6–Dec 16, 1966. 1967 The New York Painter: A Century of Painting: Morris-Hofmann, Marlborough Gallery, New York. 1968 Painting as Painting, The Art Museum of the University of Texas at Austin, February 18–April 1, 1968. 1969 The New American Painting: the First Generation, Museum of Modern Art, New York. 1972 Brooklyn Museum of Art, Brooklyn, New York. 1977 American Abstract Artists, University of New Mexico, Albuquerque, New Mexico. 1983 The Painterly Figure, Parrish Art Museum, South Hampton, New York. 1984 Emotional Impact: New York School Figurative Expressionism, Art Museum Association of America, San Francisco, curator April Kingsley: traveled 1984–6 Anchorage Historical and Fine Arts Museum, Anchorage Alaska; Museum of Art, Fort Lauderdale, Florida, University Art Gallery, University of Florida, Gainesville, Florida; Oklahoma Museum of Art, Oklahoma City Oklahoma; Beaumont Art Center, Beaumont, Texas; Laguna Gloria Art Museum, Austin, Texas. 1985 Recent Acquisitions, Museum of Modern Art, New York City. Exhibition of Avery Professors, Edith C. Blum Art Institute, Bard College Center, Annandale on Hudson, New York. Visiting Artists, Kansas City Art Institute, Kansas City, Missouri. Survival of the Fittest, Ingber Gallery, New York City. 1986 38th Annual Purchase Exhibition, Hassam and Speicher Fund, American Academy of Arts and Letters, New York City. American Masters: Works on Paper, Corcoran Gallery of Art, Washington, DC. Hans Hofmann and his Legacy, Level Meyerson Galleries, New York City. Obscure Guerilla Chieftains of the Hemisphere, Area X Gallery, New York City. Elders of the Tribe, Bernice Steinbaum Gallery, New York, December 2, 1986–January 3, 1987; between January 1987–June 1988 exhibition travels to ten other museum venues. 1987 Working in Brooklyn Painting, Brooklyn Museum, New York, June–September 7, 1987. 1988 Enduring Creativity, Whitney Museum of American Art, Fairfield County, Stanford, Connecticut, April I–June 15, 1988. The Figurative Fifties, travelling exhibition, Newport Harbor Art Museum, Newport Beach, California. 1989 Face Off, Edward Thorpe Gallery, New York. 1990 The Provocative Years 1935–45, Provincetown Art Association and Museum, Provincetown, Massachusetts. 1991 Smith Collects Contemporary, Smith College Museum of Art, Northampton, Massachusetts. 1992 Big Paintings, Tucson Museum of Art, Tucson, Arizona. 1994 Paths of Abstraction: Painting in New York 1944-81, Bertha and Karl Leubsdorf Gallery, Hunter College, New York. 1999 Joint exhibition with Leon Golub, Edward Hopper House, Nyack, New York. July, 1999. 2000 Forum Forty-Nine Revisited, exhibition Provincetown Art Association and Museum, Provincetown, Massachusetts. 2001 The Stamp of Impulse: Abstract Expressionist Prints, Worcester Art Museum, Worcester, Massachusetts, April 22–June 17, 2001. 2002–2003 Meditations on the Human Spirit, traveling exhibition organized by Meridian International Center, Washington, D.C.
Provincetown Painters, ACME Fine Art, Boston, Massachusetts, 2002. 2003 Recent Acquisitions, Museum of Fine Arts, Boston, Massachusetts. The New York School, ACME Fine Art, Boston, Massachusetts. 2005 Provincetown Painters, ACME Fine Art, Boston, Massachusetts. Artwork From the Collection of William Freed & Lillian Orlowsky ACME Fine Art, Boston, Massachusetts. 2006 Making it New: George McNeil & His Students, Montserrat College of Art, Beverly, Massachusetts, August 28 – October 28, 2006. 2007 Figuratively Speaking, ACME Fine Art, Boston, Massachusetts, March 23 – April 28, 2007. 2008 The Art of Gesture, David Findlay Jr. Fine Art, New York, New York, April 8-29, 2008. Summer Salon, ACME Fine Art, Boston, Massachusetts, June 27 – August 16, 2008. Works on Paper, ACME Fine Art, Boston, Massachusetts, November 21 – December 23, 2008. 2009 Gallery Selections, Hollis Taggart Galleries, New York, New York, January 15 – March 7, 2009. Days Lumberyard Studios, Provincetown, 1915-1972, ACME Fine Art, Boston, Massachusetts, May 15 – August 22, 2009. Hans Hofmann & George McNeil, Morrison Gallery, Kent Connecticut, December 12, 2009 – January 31, 2010. 2010 American Modernists in Wyoming: George McNeil, Ilya Bolotowsky, and Leon Kelly, University of Wyoming Art Museum, January 30 – August 7, 2010. Alcoa Collection of Modern Art, Pittsburgh, Pennsylvania. Ciba-Geigy Corporation, Arosley, New York. DuPont Gallery, Washington and Lee University, Lexington, Virginia. Exxon Corporation, New York City. Farnsworth Art Museum, Rockport, Maine. Fort Lauderdale Museum of Art, Fort Lauderdale, Florida. Gray Art Gallery, New York University, New York. Huntington Art Gallery, James Michener Collection, University of Texas, Austin, Texas. Hyde Collection, Glens Falls, New York. Kresge Art Museum, East Lansing, Michigan. Lannan Foundation, Los Angeles, California (dispersed). Mead Art Museum, Amherst College, Amherst, Massachusetts. University of Michigan Art Museum, Ann Arbor, Michigan. Museum of Art, Fort Lauderdale, Florida. Neuberger Museum, State University of New York at Purchase, New York. North Dakota Museum of Art, Grand Forks, North Dakota. Northern Michigan University Art Museum, Marquette, Michigan. Oklahoma City Art Museum, Oklahoma City, Oklahoma. Philip Morris Corporation, New York. Provincetown Art Association and Museum, Provincetown, Massachusetts. Smith College Museum of Art, Northhampton, Massachusetts. Smithsonian Institute Print Collection, Washington, DC. Springfield Art Museum, Springfield, Missouri. University of New Mexico Art Museum, Albuquerque, New Mexico. Weatherspoon Gallery, University of North Carolina at Greensboro, North Carolina. Weisman Museum of Art, Pepperdine University, Malibu, California. Zimmerli Art Museum, Rutgers University, New Brunswick, New Jersey.